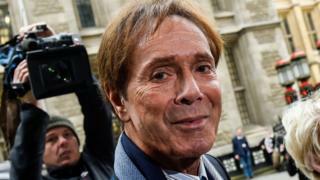 A BBC reporter covering a police search of Sir Cliff Richard's flat spoke of a "bonkers but brilliant" day, the singer's privacy case has been told.Dan Johnson used the words in 2014 in reply to a text message from the head of media at South Yorkshire Police after the raid, the High Court heard.Carrie Goodwin had asked him whether he had had a "good day" reporting on the historical sexual assault inquiry.Sir Cliff denied the allegation and was never charged with an offence.He is suing the BBC for the misuse of private information and breaking data protection rules. The 77-year-old star has told the judge how the coverage of the raid on his flat in Sunningdale, Berkshire, in August 2014, left him feeling "forever tainted" and "smeared".The BBC says its report was made in good faith and of legitimate public interest. Detail of the text conversations between Mr Johnson and Ms Goodwin on the day of the raid were raised in court by the BBC's barrister Gavin Millar QC.He referred to the message Ms Goodwin sent a few hours after the search and the first BBC broadcast, to ask him whether he had had a "good day".Mr Johnson said it had been "bonkers but brilliant. Thanks for your help. Hope it went well from your point of view. Any idea what happens nextIn response, Ms Goodwin said: "Everyone thinks we tipped you off so lots of grief from the media but nothing we cannot handle. "But cross-examined by Mr Millar, she denied police had been happy to attract the BBC coverage.South Yorkshire Police has settled its own privacy case with Sir Cliff by paying him ?400,000 and argues that the BBC should pay a share of this because its actions were "far more causative of the damage suffered".It had been looking into a claim Sir Cliff sexually assaulted a boy under the age of 16 in Sheffield in 1985.Former Det Supt Matthew Fenwick told the court on Monday that police only agreed to tell the BBC about the raid because it had wanted to delay Mr Johnson reporting on the story before it had a chance to search Sir Cliff's flat.